This is a great alternative to the Inca Trail. Going this route, you’ll be able to visit some of the most beautiful places in the Andean jungle and see the snow covered Salkantay Mountain (altitude is 6372 m). You will have the opportunity to see beautiful landscapes with a variety of endemic flora and fauna and stop by part of the Inca trail, Llactapata, which is an enclosure built on the mountain facing Machu Picchu. Inka Trail to Machu Picchu is one of the world’s most popular tours, this road is full of beautiful landscapes, trails surrounded by mountains, cloud forests, etc. They are somewhat natural appeal of this road which was created by the Inkas centuries ago, this path made of stones used it to reach the lost city of Machu Picchu. Many tourists come to Peru, Travel to this wonderfull contry, to see Machu Picchu but this is over, especially in peak season is from May to August, if you want to reserve for these dates, you have to do with 5 or 4 months in advance, but many people do not know this and do not know this problem, and they end up choosing the alternative Inca trail, which is the Salkantay trek, this way you come to Machu Picchu and Aguas Calientes for hydroelectric site. 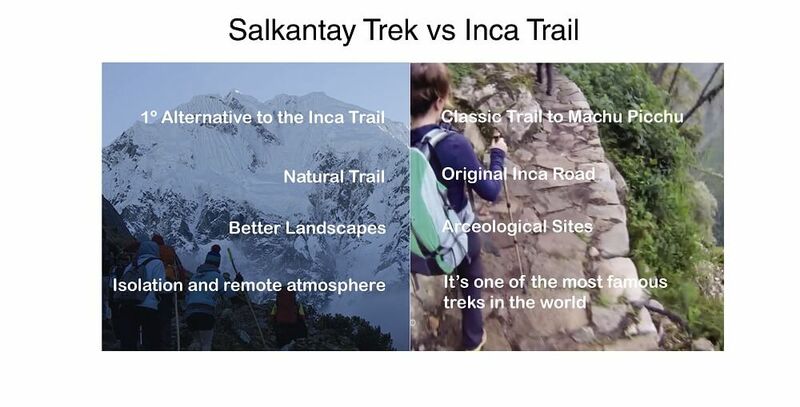 So already knowing the Inca Trail and Salkantay trek compare can do, as you saw some key points of difference between two paths’re in the picture above, we can detail more things now. Travel to Peru is always good and stay in Cusco is more amazing, but all Peru have many many amazing sites to visit and are reasons to travel. Just choose one of this tours in Peru are considered great. In Salkantay hike you have no ruins and Inca Trail, although both wonderfull landscapes of the Peruvian Andes and part of the jungle. They ride horses instead of porters and Inca trail, also have to carry tents to sleep in them, a sleeping bag and food also, in some places are almost equal to the Inca Trail. And obviously the Inca Trail is limited and restricted by the Peruvian government, whereas the salcantay hike is not, although its large influx ultimamamente the Peruvian government is thinking reinstringir, but for now is still free the way. The altitude of Salcantay is 6,274 meters and is higher than the Inca Trail, Salkantay hiking is a more natural route, with cold nights and some hot days, this mountain is snow cover, if, as you hear, salcantay is a mountain and the Inca trail is a route. In short Salcantay is more difficult than the Inca Trail, and is also full of adventure, and why? because in some parts of the route can be done zip linig. Read the next items to see the differences between two famous routes to Manchu Picchu. Salkantay hiking is know like the no.1 alternative to the Inca Trail, and the best to it, in Cusco and Peru is the best route to Machu Picchu. Most people do this salcantay hiking because they can not get Inca Trail or they want to avoid the crowds. Salcantay is more of a nature hike and has much better landscapes. Inca Trail has arceological sites. There are no ruins on the Salcantay route. Salcantay hike is a lot cheaper than the Inca Trail. With Salcantay you also do get to experience the sunrise over Machu Picchu, because you arrive in Aguas Calientes on the 4th day and then on the 5th day you get up early to walk up to Machupicchu for the sunrise like others tours to Machu Picchu. Book as soon as possible for the Inca trail, as stated above with 5 or 4 months in advance. With Salcantay is not necessary , but is better than also book early, to search for options or just for see available to groups and you can join. An day or night can be cold on this travel, but other days is snowing, this travel has each day unforgettable, and people in this route and travel have the best experience in their life. Travel to Cusco – Peru to find the best routes that the Incas left. Cusco and all Peru is a paradise that all people want to travel day after day, thanks to the kindness of its people are friendly as angels (only some haha! ), Book with Itep Travel to have a better experience on your trip and adventure. In Peru there are many tours and these tours are available day after day, like a shopping market, thats why is considered a home of Incas, where you can find every day and in every where a amazing place to visit. See Salkantay Trek 4 days itinerary. See Inca Trail 4 days itinerary.